The experiments developed were based on aerial algae, which obtains very similar properties in terms of photosynthesis comparing to aquatic algae, but does not need constant flow of water – although a certain humidity level must be maintained – in order to stay alive. 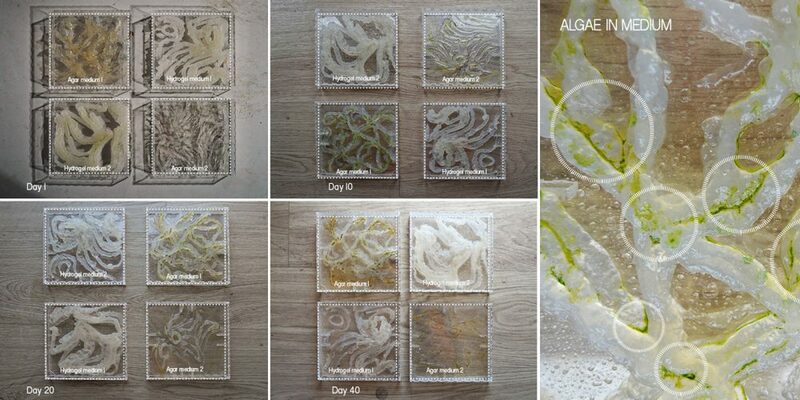 Another interesting feature of algae is that when environmental conditions are adverse, algae goes into a form of hibernation until conditions are once again favorable. With this being said, aerial algae is much better suited for use in terms of maintenance. 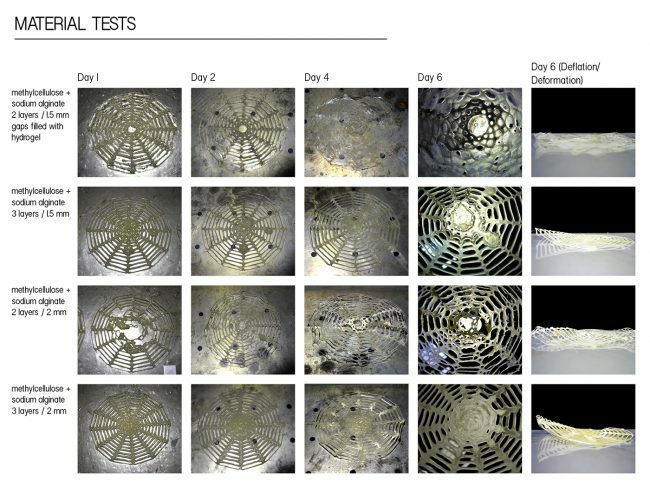 So the decision was taken to 3D print algae medium with an embedded culture, using a robotic arm fitted with a pump extruder. The first showed good algae growth rate, but some constraints were identified – such as extrusion temperature and algae insertion, which can be only done after having completed the printing of the medium. 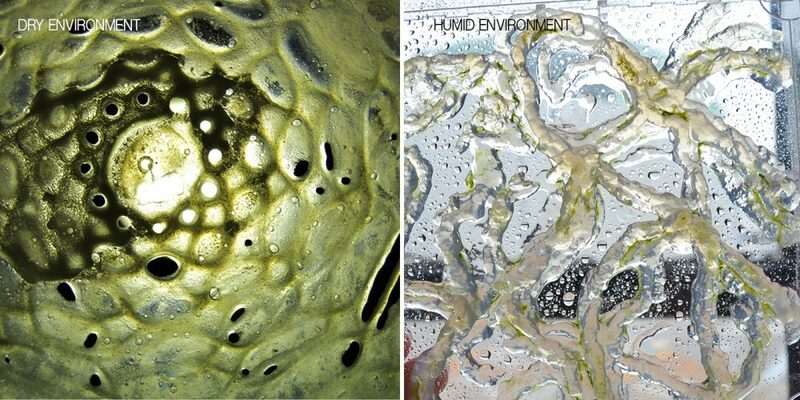 The second medium, on the contrary, forms a homogeneous mass that can be extruded at room temperature, having added the algae to the mix prior to printing. 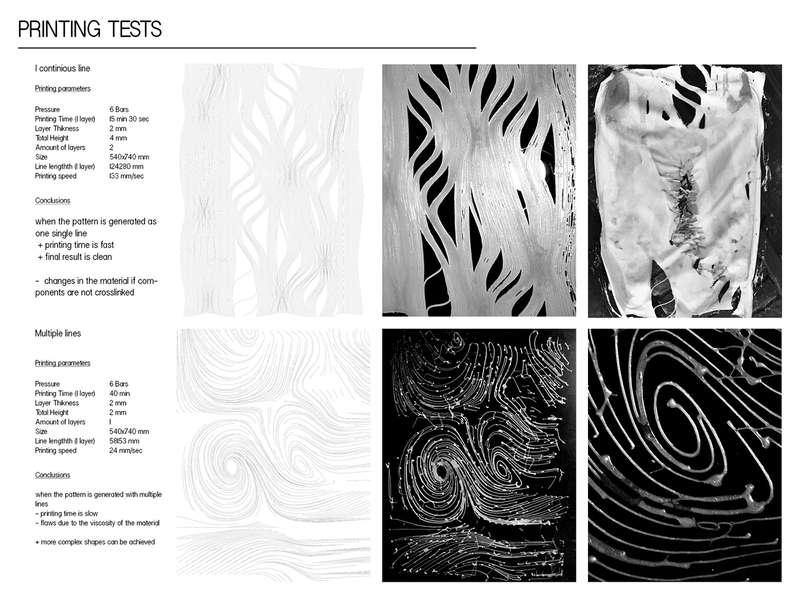 Thereby methylcellulose was chosen for further tests with a robotic arm, including tests on different printing parameters (pressure, speed, line thickness, etc), as well as deflation/ deformation tests in order to understand the behavior of the material while drying. 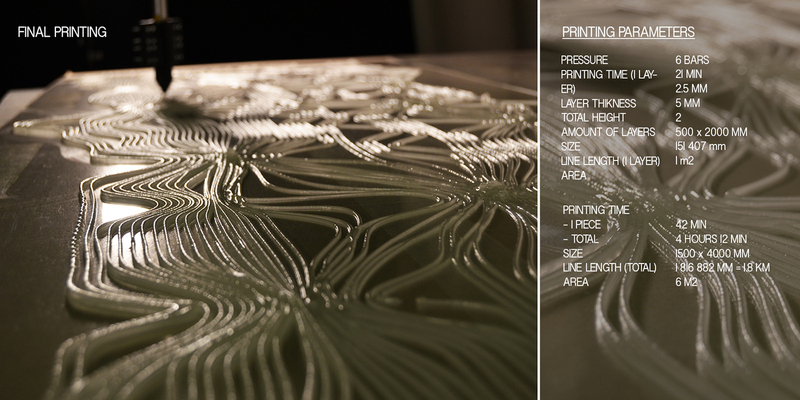 The final result represents the first large scale hydrogel print with the size of 1.5m x 4m. It was designed according to previous material tests. 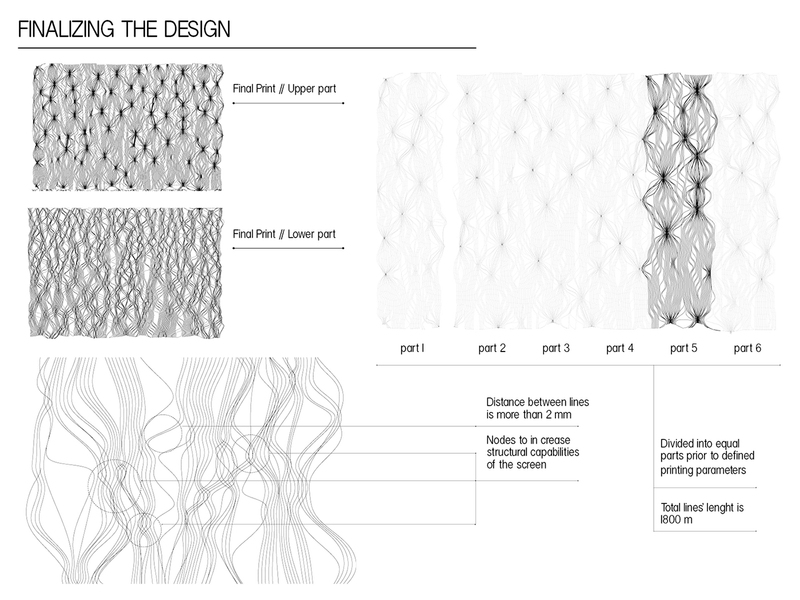 It was demonstrated that better results can be achieved by printing a pattern with one continuous line, creating so called nodes (line intersections) enhancing the structural capabilities of the screen. For the final print the pattern (approx. 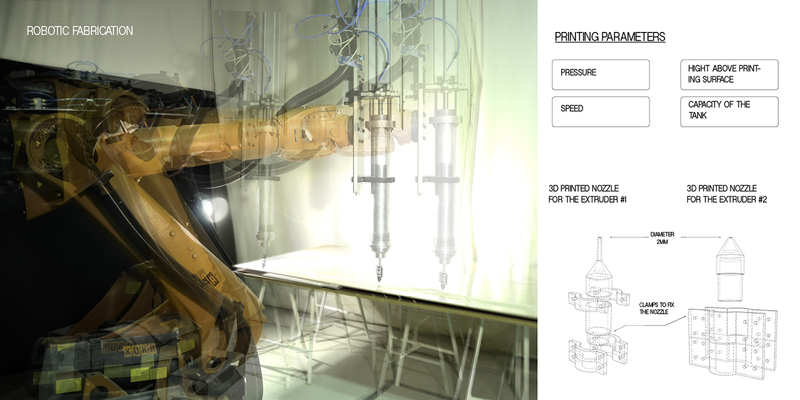 1 km) was divided into equal parts in order to fit the available printing area (0.5m x 2m). Moreover this fabrication method demonstrated some advantages when compared to a typical water pump systems that are using aquatic algae. The whole existence of life on earth evolved from bacteria, and we house them by the trillions on or inside of our bodies. These bacterias are incredibly important to our survival and, often, they have the power to decide our fate. Their group-behavior suggest an intelligence far beyond what most of us can imagine and it is this intelligence we wanted to explore, learn from and develop a project based on our findings. We believe that the future is moving towards a more advanced technological intelligence in which our devices and sustainable urban infrastructure will become more adapted to the human body of the user. No longer will there be static object and us, biology and technology are merging. From the beginning of human history, people have used technology to enhance the human experience and extend the abilities of our bodies. The overarching aim of technology is to improve human lives, in the past, in regards to nature and technology, humans have manipulated and ‘conquered’ their environment for their own benefit. Now our aim is to engage in a more symbiotic relationship with nature, by understanding the natural patterns and processes better.